I always make dashi stock in donabe. With the gentle and even heat distribution of donabe, my simple "home" style donabe tastes always great. Any classic-style donabe would work perfect for making dashi stock. I use my classic-style medium-size "Hakeme", especially since the size is perfect for making 2 liters (2 quarts) of dashi stock. Here's my standard "awase-dashi" (kombu and dry fish base) stock recipe. There are different kinds of dashi stock styles (kombu, kombu+dry fish, shiitake, kombu+shiitake, etc.) and so many different ways of making them. This time, I experimented to make extra-rich broth with kombu and shaved dry fish. 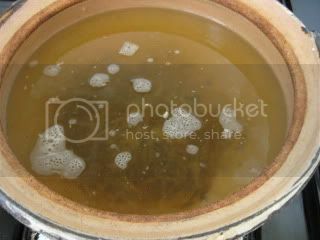 One of the common notions about making good dashi stock is not to heat the kombu in water too long or at a too hot temperature, while soaking it in cold water for multiple hours before heating is considered to be welcome. 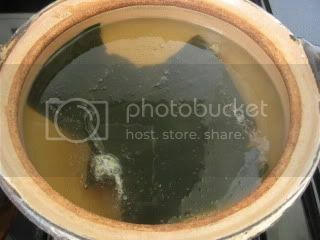 If you simmer or boil kombu, it would ruin the dashi stock with the bitter flavor. So, what I did was after soaking the kombu in cold water for a couple of hours, I infused it over very low heat for 1 hour. The temperature is below simmering: about 140F (60C) degrees. I used a little over 2L (2 quarts) water and 2 large pieces (2 of 2"x4") of premium (thick) Hidaka Kombu. (If you want to achieve lighter broth color, Rishiri kombu is recommended.) Kombu rehydrates and expands to much bigger in water, so you can cut each piece in half before start to heat. After removing the kombu pieces. I increased the heat to simmer and added a good handful of mixed shaved dry fish. It was low-simmered for about 3 minutes. 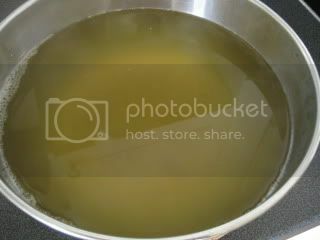 The dashi stock was strained into a bowl. The long infusion made the aroma so rich, and the flavor was even deeper. Wonderful. You can use premium-rich dashi stock for something simple like miso-soup, to something unique like ramen broth.